Separate, but packaged together, boiler and exchanger design allows an operating boiler temperature range of 180° to 190°F. This provides a high enough boiler temperature to avoid condensation and corrosion that can occur at boiler temperatures of 160°F or lower. Scotch Marine boiler is designed in accordance with ASME standards and utilizes a refractory lined back plate to provide a durable thermal barrier and eliminate corrosion and leakage problems. The tightly constructed Scotch Marine design also permits use of a forced draft burner with safety. The HeatX burner is designed to burn sewage gas and auxiliary fuels such as natural gas, LPG, or fuel oil upon sewage gas depletion. Manual or automatic burner control is possible in blending or switchover modes. The burner is the same proven forced-draft design utilized by commercial boiler manufacturers, and has been successfully applied on Walker boilers for decades. Since forced-draft fans handle only cold, uniformly dense combustion air, they provide greater efficiency and a more easily controlled air-fuel ratio for simpler operating and reduced maintenance. The exchanger unit is an efficient concentric tube type utilizing countercurrent forced circulation of hot water and sludge. Hot water, circulated through the tube annulus, and sludge are circulated at high velocities to take advantage of increased heat transfer at the high velocities. This permits efficient operation with less surface area than in other designs. End castings are designed for easy removal to permit inspection of tubes and to prevent any leakage of sludge into the heating water. Rifling in the castings causes turbulence to reduce fouling at the bends. 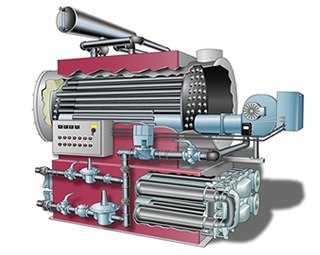 Operating temperature of the exchanger ranges from 140° to 150°F to prevent sludge baking on the tube surfaces. For this reason, Walker HeatX units have operated at full efficiency for 25 to 30 years. This is accomplished by blending hot water from the boiler prior to the exchanger.